Jacques Lezra is Professor of Spanish and Comparative Literature at New York University, and a member of the Departments of English and German. In 2016 he became a member of the Department of Hispanic Studies at the University of California—Riverside. His most recent book is Contra los fueros de la muerte: El suceso cervantino (2016), collecting articles and unpublished essays as well as translations of chapters from his first book, Unspeakable Subjects: The Genealogy of the Event in Early Modern Europe (1997). His Wild Materialism: The Ethic of Terror and the Modern Republic appeared in 2010; the Spanish translation was published in 2012; the Chinese translation appeared in 2013. Lezra is the co-editor of Lucretius and Modernity (2016). With Georgina Dopico Black, he edited the unpublished manuscript of Sebastián de Covarrubias’s ca. 1613 Suplemento al ‘Tesoro de la lengua castellana’. He has edited collections of essays on the work of Althusser, Balibar and Macherey, and on Spanish republicanism. You’ve asked me to join other members of the Modern Language Association who have written statements about BDS. I found it hard to take a public stand when the matter came up for me about two years ago: the fear of losing old, dear friendships weighed; of angering family. Things in Israel/Palestine have changed since then, and here too, for me. Thank you for asking again. I support the BDS movement, and I believe academic organizations like the MLA should vote to endorse the BDS motions that will come before them. I support the movement for reasons similar to the ones that led me to support the boycott of South African goods during the years of apartheid. Then advocates of sanctions were addressing in one way the scandal of an openly racist regime that sought legitimacy from and financial stability in the international community. We hoped isolating, shaming, and to whatever extent we could manage financially constraining the apartheid regime would help bring about its end. Matters in Israel/Palestine are different. The dispossession of Palestinians and the juridical license to guarantee their subjection through any means necessary is not, with signal and repugnant exceptions, expressed or founded in explicitly racist terms. The moral claim upon us, however, is not different from the claim made upon us by the violence of the apartheid regime. Violence, systematic, structural and punctual, unceasingly exerted in every domain, supported economically and sheltered politically and militarily by the United States: this is the day-to-day experience of the Palestinian population under occupation. I feel a special obligation to reject this state of affairs and to express my solidarity with the people of Palestine, because the country I live in and pay taxes in provides this support to the Israeli government. Timothy J. Reiss is Emeritus Professor of Comparative Literature at New York University. His most recent books are Against Autonomy: Global Dialectics of Cultural Exchange (2002), Mirages of the Selfe: Patterns of Personhood in Ancient and Early Modern Europe (2003) and the edited collections Music, Writing and Cultural Unity in the Caribbean (2005) and (co-ed.) Topogra phies of Race and Gender: Mapping Cultural Representations (2008-9). He is currently finishing a book on Descartes and his age’s political practice and thought, another on rethinking the Renaissance as part of long continental and oceanic intercultural exchanges, and an edited collection on Ngugi wa Thiong’o. Concerning the MLA, Israel and BDS, I have more than once been told that the issue is not one for a language and literature professional association that is not a political organization. To take a Kantian aesthetic autonomy stance in this case is of course hypocritically selective, since we have taken many political positions over the years (not least over South African apartheid), when the issues pertained to our professional concerns. Apropos of BDS, these concerns are deep indeed, even could we ignore the daily tortures Israel inflicts on Palestinians, ongoing theft of land, orchards and other property and the often increased individual and collective military and civil assaults. But we cry about academic freedom as our particular (professional) realm, we cry about intellectual freedom more broadly, as do Israelis—for themselves (not least against BDS). We readily ignore the fact that Israel has forever restricted Palestinian rights to those freedoms, and continues to do so. Everything we study touches how people think, how we act, morality, speech, worldly and spiritual acts, events, thoughts, deeds. These are, however we define it, what literature and the arts are about—who, what, why humans are—all humans. Israel has for decades been trying to prevent Palestinians from such expression. And while I believe those of us from “First World” cultures, above all European, to be responsible to a past for which we may not be responsible but from whose oppressions we benefit, silence on ongoing oppressions against which collectively raised voices can have a beneficent effect does make us responsible, now, for those oppressions. Charles Hirschkind’s essay “A Smear in Disguise: Comments on Starrett,“ is a succinct and powerful rebuttal to Gregory Starret t’s “The Symbolic Violence of Choice,” which recently appeared in Anthropology News. 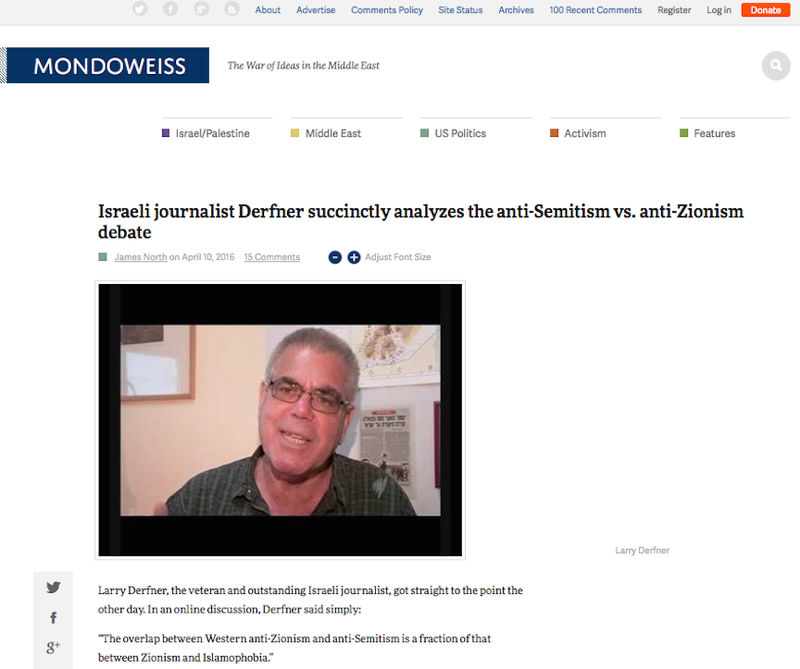 Hirschkind reveals that Starrett’s attack on the AAA boycott resolution as a form of symbolic violence is a not-so-covert and irrational smear of proponents of the boycott of Israeli academic institutions. As Hirschind notes, Starrett seeks to discredit the AAA resolution in support of the academic boycott by mocking proponents and ridiculing their political commitments. Furthermore, Hirschkind crucially points out that Starrett’s statements enact the very symbolic violence that he claims is a characteristic of the academic boycott movement among anthropologists. In “The Symbolic Violence of Choice” (Anthropology News, March 2, 2016), Gregory Starrett denounces the Resolution to Boycott Israeli Academic Institutions currently being considered by AAA members on numerous grounds. Despite a thin and misleading veneer of impartiality, the essay is unequivocal both in its condemnation of the proposed resolution and its disparaging assessment of those who support it. Having read the piece a number of times now, I find it profoundly confused, a set of rhetorical feints disguised as an analysis. But given the timing of its publication, just before AAA members must decide on the boycott initiative, I feel that a serious response is necessary. Anyone who has followed the debates in connection with the MLA’s proposed boycott resolution will find Starrett’s “arguments” all too familiar and Hirschkind’s critique of this anti-boycott position remarkably relevant. Anthropologists for the Boycott of Israeli Academic Institutions presents “Why We Need Academic Boycott: The Struggle for Education at Birzeit University.” This short video features Palestinian teachers and students at Birzeit University in the West Bank speaking about their experiences under Israeli occupation and the need for an academic boycott. The American Anthropological Association is voting on the boycott of Israeli academic institutions from April 15 to May 31 by electronic ballot.